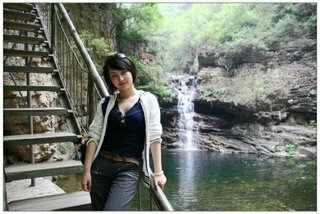 Jingdong Canyon scenic area, located north of Yuzishan Village, is composed of two scenic areas ?? the grand canyon and Jingtai Mountain. The scenic area is adjacent to Panshan Mountain in the south, and to the Jingdong Cave, Jinhai Lake, Huangyaguan Great Wall, the Eastern Tombs of the Qing Dynasty and Wuling Mountain in the east, and is about 82 kilometers from downtown Beijing. 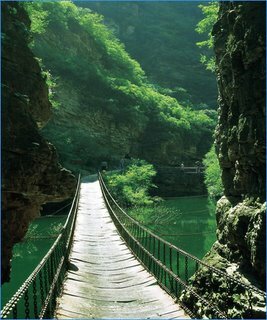 Since its opening in 1992, many visitors have flocked to the area and it is a well-known scenic area in Beijing and Tianjin.The canyon, about three kilometers long, boasts of dozens of natural sceneries and landscapes, such as green mountain and crystal water, caves and ponds, waterfalls and springs. Jingdong Grand Canyon is situated about 85 kilometers east of the center of Beijing. From an aerial view the canyon, thanks to its many water surfaces, looks like a glittering gem inlaid within the triangle formed by the three big cities of Beijing, Tianjing, and Tangshan. To the south of the canyon lies Panshan Mountain, while to the east lies Huangyaguan Great Wall, Duyue Temple, the Imperial Tombs of the Ming (CE 1368-1644) & Qing (CE 1644-1911) Dynasties, and Wuling Mountains, to name the most noteworthy sites. The best season to explore this vast natural wonder is in early autumn, in August or September. Also called Wulongtan ("Deep Pool of Five Dragons") Grand Canyon, Jingdong Grand Canyon spans some 6 square kilometers. Inside the canyon are numerous caves, deep pools, craggy peaks, splashing waterfalls, and an enormous reservoir. Hundreds of hectares of pine trees grow in the canyon. Nestled here and there under the verdant pines are small villas and log cabins where visitors to the canyon can pause for a rest. The reservoir's 30-meter-high dam provides deep water for those fond of water sports. In the sunny spring time, flowers are everywhere on the mountains; in summer, all mountains become green, mountain springs gush and flow, and visitors here would feel cool away from the suffocating summer heat; in autumn, all trees on the mountain turn red and golden, and visitors have the chance to harvest ripe fruits; and in winter, the mountains are covered with snow and ice, and the waterfalls become icy, producing a polar scenery.The scenic area has more than 60 tourist attractions. It has two special scenic areas ?? the Jingtaishan Forest Scenic Area and the Canyon Scenic Area. At the bottom of the canyon, there are five deep ponds connected by brooks, six tourist function zones namely canyon expedition zone, mountain-top sightseeing zone, water amusement zone, exhibition zone, fruit-picking zone and the leisure .